JACKSONVILLE, Fla. - Jacksonville may be one of the few cities in the country where you can have an outdoor fishing experience downtown, in the shadows of looming high-rises. It may also be one of the few places where you can get from almost any golf course to a good fishing spot - or vice versa - in a matter of minutes. Of course, you might want to think about changing clothes. Jacksonville has some of the most versatile fishing available anywhere in Florida. Jacksonville - or the First Coast, as the marketers like to call it - has 68 miles of Atlantic Ocean coastline and 400 miles of river, Intracoastal Waterway, creeks, lakes and ponds to fish in. South Florida gets most of the pub when it comes to Florida sportfishing, but the fishing in and around Jacksonville is as diverse as any in the fish-rich state. If you're facing Miami, look to your left and you'll find the Atlantic Ocean. Then, you'll find the St. Johns River flowing south from there, through downtown, on its way to Lake Okeechobee in south Florida. Tucked in between, you'll find the Intracoastal Waterway, with literally hundreds of creeks, named and unnamed. All teeming with fish, if you know how to find them. Summer is the best for offshore fishing, when large, baitfish schools ripple close to shore, and you can catch anything from shark, cobia, amberjack, tarpon and just about any pelagic fish you'd care to name. Jacksonville hosts the biggest kingfish tournament in the country. You can chum for tarpon or seek out feeding Spanish mackerel, which will hit just about anything you throw at them when they're in a feeding frenzy. That's true of most places in Florida, though; the inshore action is what sets the First Coast apart. The mouth of the St. Johns produces the heaviest redfish in Florida, and as it winds its way southward, the water becomes less salty and you'll switch to freshwater gear, throwing for bass, bream, catfish and bluegill. The river is renowned among pro bass anglers. The lower St. Johns (actually, it's further north since the river flows north) also gives up some of the biggest spotted seatrout trout in the state. Spring is best for the big ones, though trout can be caught here year-round. Beware the tidal fluctuation here though - it's the strongest in Florida, anywhere from 4-6 feet, and goes through two cycles every 24 hours. If you want to catch fish here, pay close attention to the tides; fish the first of the incoming and all of the outgoing. Look for mud flats and oyster beds in creeks off the Intracoastal, and you might try fly-fishing for reds, a growing sport. Kayaks can get you into the backcountry better, without worrying as much about getting stuck in the mud when the tide goes out. About that downtown fishing: Big, striped bass are caught in that part of the river, which divides downtown from the South Bank. You catch them mostly in the cooler months. They started stocking in the 1970s and now release about 200,000 stripers every year. They are big and mean, and love topwater lures under the right conditions. Jacksonville isn't as heavily marketed as other, better-known golf destinations in Florida, but it has its share of excellent golf courses. You may have to drive a bit to different courses because the area is so spread out, but the golf and fishing themselves are never far apart, if you choose wisely. Here are just a few suggestions. 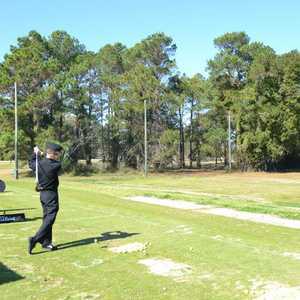 • Windy Harbor used to be known as the Mayport Golf Club. It's a military course in the little community of Mayport, which has been an active fishing community for generations, and looks like it. People here describe the course as being a classic "hidden gem." Mayport has some great seafood restaurants and, more importantly, great boat launching facilities. A lot of charters work out of here as well, if you want someone to take you to the honey holes. • The TPC at Sawgrass is in Ponte Vedra, with both the ocean and Intracoastal nearby, so you could easily combine a day of fishing and golf here. The Stadium course is a nationally recognized course, home to the Players Championship, but you'd be surprised how many golfers prefer the cheaper Valley course. This is where you might have seen television coverage of golfers fishing in the stocked lake on the course: don't fish like a golf pro, go after the wild ones. 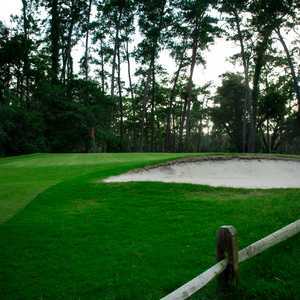 • The Golf Club North Hampton is one of the top courses in the area, an Arnold Palmer design in Fernandina Beach. This is a little north of Jacksonville, and in this area, the Intracoastal Waterway and the beaches are never far away. The course has man-made sand dunes, bridges and rolling elevation, with 10 spring-fed lakes lined with coquina boulders. Plus, green fees are reasonable. • Amelia National is in the same area, in ritzy Amelia Island. Green fees here are heftier, but the course is a good one, a Tom Fazio design. It's a Carolina-style layout, with pine straw bordering the fairways, and only four holes will see houses. • Ocean Hammock at Palm Coast, south of Jacksonville, was named a modern classic by Links magazine. It's an oceanfront course that weaves through forest, wetlands and coastal dune formations. It plays along the ocean, though dunes block a lot of the view, but you could tell your playing partners you're going to the rest room and try a few casts for whiting just off the beach. The course is billed as the first true, oceanfront course in Florida in 70 years. They dug up dirt from inland holes to create lakes and piled them on oceanfront holes so you can see the ocean. "The results are breathtaking," TravelGolf wrote in an earlier review. "The six holes created along the dunes that offer unfettered views of the Atlantic Ocean are as inspiring as any in Florida." • The Ocean Course at Ponte Vedra Inn and Club (circa 1928) was designed by British architect Herbert Bertram Strong and built in 1928. They didn't have earth-moving equipment then, so Strong used 100 mules dragging "slip pans" to dredge lagoons and build a series of mounds that impose dramatic undulations. The 150-yard ninth hole is believed to be the first ever island green designed. Don't fish here, there are better spots nearby.